Good morning Fratres, the subject of my talk today is nothing less than the Universe in all its infinite glory. However, this does not mean that I will be addressing such diverse subjects as big bangs, black holes, dark matter or the multiverse. This is more of a story of how the concept of an infinite Universe was born and evolved and follows on from the talk given by our Celebrant at the last meeting as I will also be focussing on those radical thinkers or “outliers” who have made an extraordinary contribution to our understanding of the hidden mysteries of Nature. Fratres, we stand here today on this Earth, somewhat dazzled by the light of our supposed knowledge, our place in the Universe perhaps a little diminished by recent discoveries but still largely secure. We are bombarded by revelations and innovations on an almost daily basis. But it could be said, and was indeed said by no less a person than Sir Isaac Newton that we only arrived at this point having stood on the shoulders of giants; those thinkers who throughout the ages have pondered on the deepest mysteries of our Universe and added to the understanding of our place within it. These are the supreme thinkers who dared to challenge the status quo and to imagine something different, something beyond the current understanding. So where to begin our story, well Fratres Space is big, really big! You just wouldn’t believe how vastly, hugely, mind-bogglingly big it is. These are famous lines from the Hitch-hikers guide to the Galaxy of course by Douglas Adams. But how do we know that the Universe is vastly, hugely, mind-bogglingly big? Might it even be infinite in size and what do we mean by the infinite anyway. The mathematician David Hilbert said that no other question has ever moved so profoundly the spirit of man, no other idea has so fruitfully stimulated his intellect yet no other concept stands in greater need of clarification than that of the Infinite. For the purposes of my talk today I will be using the term Infinite to mean a concept describing something without any bound or larger than any natural number. This may not be the strict mathematical definition and in fact there is more than one mathematical infinity but it will do for our purposes. I will use the term Universe to mean all of space and time and its contents, including planets, stars, galaxies, and all other forms of matter and energy, seen and unseen. The Universe doesn’t appear to be so big right here and now from this room and certainly not infinite. Can we even imagine an infinite space? 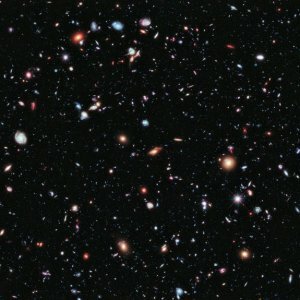 But, if you look at a picture taken by the Hubble Space Telescope of what we might call the Universe and if we are prepared to believe in the remoteness of individual stars and galaxies and trust that each of the points of light in the picture is a Galaxy or cluster of Galaxies then this does indeed seem to show something vast beyond our imagining. But how did our Forebears develop the concept that this Earth on which we live is just one small part of an impossibly huge, perhaps even infinitely sized space? If you will allow me I would like to take you on a journey of the mind, from a consideration of this Earth on which we are all standing so firmly to that of a Universe vast in scale, and then perhaps beyond to a contemplation of the Infinite. This is admittedly quite a challenge, it is a journey that was begun by our ancient Ancestors using their senses alone to make direct observations of their world and then to take early measurements of the earth and sky; through to countless generations of philosophical and religious thinkers turning their minds to the contemplation of their place in the Cosmos and finally to natural scientists and mathematicians using logic to reason, to calculate and to discover. If you will this is a story about how profound ideas are born and evolve. So the contemplation of the Infinite began simply enough when the first thinking being’s looked up at the night sky. Grasping for an understanding of what they were seeing and what lay beyond their simple physical limits undoubtedly led these early humans to contemplate their place in the world and to consider new concepts relating to the forces which controlled their lives. The earliest images that have ever been discovered of the sky depict the Sun, a lunar crescent and groups of stars including some distinctive formations that we are all familiar with. These objects obviously held ritual and spiritual significance to our early Ancestors. They undoubtedly believed that the heavens held power over earthy existence and therefore that they were worth studying. When our Ancestors started observing the stars even for quite a short time then one thing was clearly undeniable, they were moving. With just a little persistence and some simple measurements early humans worked out that most of these points of light were moving in rough circles around a fixed point and that these movements were not independent of each other but were somehow connected. They therefore postulated that these objects must be joined together on a distant surface that was itself rotating. This surface came to be called the celestial sphere, the sphere carried the stars and completed a full rotation approximately once a day. From these apparently simple observations and a few basic inferences early humans concluded that their world, as they understood it must have limits, be fixed and ordered and to have a boundary even if they could not reach it. Beyond this boundary was probably the realm of the divine. A few of the bright objects that they could see in the sky were not fixed in the same way but seemed to wander across the heavens between these circling stars. This made them unusual and they took on great significance and power in early cultures and religions. They of course became known as the Planets perhaps from the Greek term for wanderer. From these basic observations our Ancestors were soon giving some significant consideration to their place in the natural world with the earth standing firmly at centre of their perceptions. They could not feel it move but they could see the stars were moving around them, fixed to a celestial sphere and placed within what to their minds at least was a largely closed, hierarchical and ordered world of man, the heavens and the divine. This idea was powerful and persistent and occupied our early Ancestors’ thoughts for thousands of years. By 5000 BCE, ancient peoples had started constructing sun observatories and other ways of measuring the heavens in more detail. By 3000 BCE the Egyptians had a fairly accurate calendar with the year divided into 365 days, or 12 ‘months’ of 30 days and an extra five days added on at the end of the year as feast days. Other parts of the world, too, were carefully studying the heavens and by around 2000 BCE the Chinese had recorded the earliest known solar eclipse. Predicting when celestial events were going to happen began to matter greatly, and calculating their appearances with greater and greater accuracy could make you a very powerful person indeed. So, from these early observations and world views how did ideas about a boundless or infinite universe emerge, a consideration of something beyond what we could actually observe? Well as with many things this certainly did not happen overnight but also as with many things it probably started with the Greeks. The ancient Greeks inherited astronomical records from the Babylonians and applied these ideas to construct their own cosmological framework. The Babylonian records were not used just to accomplish practical goals, such as in assisting navigation, but also as a basis for thought experiments relating to the natural world and so one could say that it was here that the natural philosopher came into being. However, their cosmology was still essentially a geocentric one. If the heavens are divine and the gods created man, well then certainly the Earth must be at the centre of the Universe. One of the first major contributions of the Greek philosophers was to consider the earth as hanging in space, with the other heavenly bodies describing circles around it. They also brought in the idea of depth to the world view, for the first time proposing that the heavenly bodies occupied three-dimensional space, even envisaging them as lying different distances away from the earth. The Pythagoreans, one of the early Greek philosophical schools perhaps better known for their numerology and mathematics, postulated that the earth was spherical, a huge departure from earlier systems of thought. The idea was said to have arisen when their leader Pythagoras noticed that ships disappeared below the horizon when they sailed away, implying that the surface of the earth was curved. They also proposed that, if the moon and other celestial bodies were spherical as they appeared to be in the sky, then it made sense that the earth would be too. Pythagoreans like many Greeks saw spheres as the perfect shape. They were some of the first ancient thinkers to suggest that there was a harmony both within a sphere and between spheres, and that the movement of the planets, sun, moon and stars could perhaps be described by circles, by numbers and by a mathematical precision. This description of a cosmos characterized by harmony, symmetry, and mathematical proportion was profound and was built upon by the later philosophical contemplations of Plato. To digress for one moment, world views slowly emerged among the Greeks that now seem very perceptive. By the 5th Century BCE the philosopher Anaxagoras was writing about the sun as a huge mass of blazing metal of vast proportions. He also proposed that the heavenly bodies were rocks torn from the earth and set aflame by rapid rotation, even suggesting that they were a long way from earth, which was the main reason why we could not feel their true heat. He also wrote that the moon was a world much like our own, with valleys, mountains, and ravines, and hinted that it may be inhabited. However, he had reverted to the old idea of a flat earth, proposing that strong winds blowing under it caused the ground to ripple and give rise to earthquakes! With greater prescience, he suggested that the moon reflected the sun's light, a true stroke of genius one could say. He conjectured that the original state of the cosmos was a primordial mixture of all its ingredients which existed in infinitesimally small fragments of themselves. This mixture was not entirely uniform, and some ingredients were present in higher concentrations than others, as well as varying from place to place. At some point in time, this mixture was set in motion by the action of some divine mind and the whirling motion shifted and separated out the ingredients, ultimately producing the cosmos of separate material objects, all with different properties, that we see today. Many of his insights came from observations of the natural world and his work became the early foundation for the theory of atomism, that the universe was composed of very small, indivisible and indestructible building blocks, which ultimately became known as atoms, acting and combining in the void. This led on to the adoption by the ancient Greeks of earth, water, air and fire as concepts to explain the nature and complexity of all matter in terms of simpler primordial substances. The atomists may also have believed that matter was made up of an infinite number of structures. By the 4th Century BCE the famous Greek philosopher Aristotle had established what amounts to the classical geocentric model of the Universe, with a fixed, spherical Earth at the centre, surrounded by concentric celestial spheres of planets and stars. But, importantly, he still believed the Universe to be finite in size and he stressed that it existed unchanged and static throughout eternity. In his terms this made it perfect. 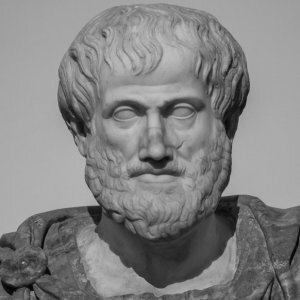 At the same time Aristotle took the four classical elements of fire, air, earth and water and said they were acted upon by two forces, gravity, or the tendency of earth and water to sink, and levity or the tendency of air and fire to rise. 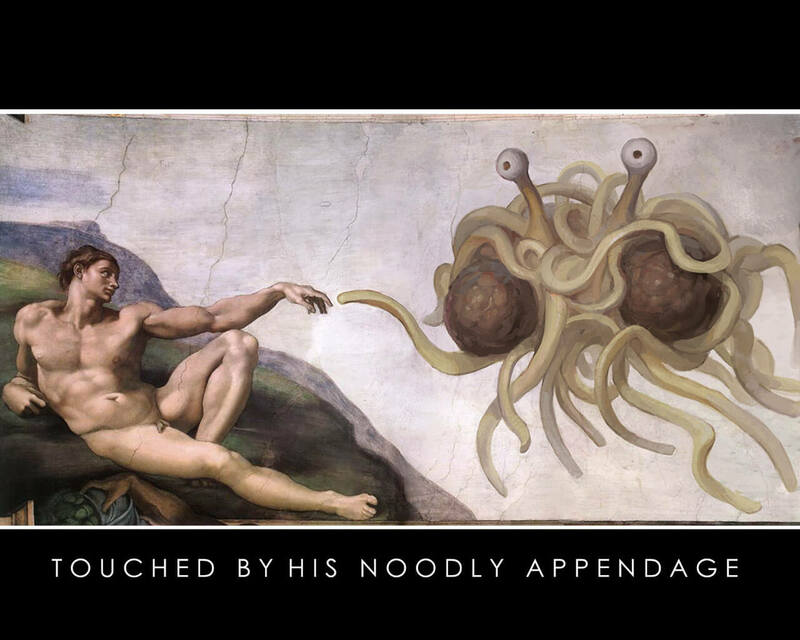 He then added a fifth element, aether, to describe the void that fills the universe above his terrestrial sphere. Now coming back to the concept of an unbounded, vast and perhaps infinite universe, like many ideas, this probably originates somewhere within Greek thought although it is difficult to say precisely where. Anaximander was the first in the Greek philosophical tradition to propose that the Universe as he understood it may be infinite. In the 3rd century BCE Aristarchus even proposed a Sun-centred universe and Archimedes estimated the diameter of his Cosmos to be the equivalent of what we might now call two light years, at that time a distance which must have seemed as immeasurably vast as the Infinite. But these ideas were certainly not yet mainstream and Aristotle’s geocentric system with a fixed boundary prevailed. One of the problems I am sure was that Greek minds were grappling with how to understand the infinite. The Ancient Greeks generally conceived of the infinite as formless, characterless, indefinite, indeterminate, chaotic, and unintelligible. The term had negative connotations and was especially vague, having no clear criteria for distinguishing the finite from the infinite. 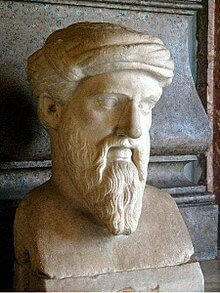 Mathematically, they hated the concept, even someone as profound in his thinking as the mathematician Euclid. But I think it is fair to say that there was a remarkable turnaround between the time of the early Greeks, when various puzzles and paradoxes associated with the infinite had made it an object of abhorrence and distrust, to a point in time where to later Greeks it had come to be associated with concepts of the divine and studied with something approaching veneration and awe. Still the concept of the earth as the centre of existence was most persistent and even by the 2nd Century AD this was still the mainstream view. It was then that the Roman-Egyptian mathematician and astronomer Ptolemy developed an even more sophisticated geocentric model for the Universe largely based on Aristotle’s earlier ideas, in which the planets and the rest of the universe orbit about a stationary Earth in circular orbits or what he called epicycles. The orbits were circles, since according to Aristotle as I have already said the circle was the perfect figure. Aristotle had also taught that the earth was corruptible, while the regions beyond the sphere of the moon were perfect and therefore unchanging and beyond which must be the realm of the perfection. In terms of longevity, Ptolemy’s description of the Universe is perhaps one of the most influential ideas ever to have been proposed and it was essentially this world view that came down to Medieval Europe via the Arabs at the beginning of the Renaissance period twelve centuries later. Although it is fair to say that both Greek and Arabic philosophers were aware of some major shortcomings in this model the seductiveness of the idea was immense. Putting Earth at the centre of being and limiting space to what could be observed and measured was undoubtedly comforting and fitted many theological teachings, so natural philosophers proposed slight adjustments to be way the planets moved making their motions more and more complex sets of circles, and circles within circles to try to account for the direct observations they were making of the heavenly bodies. Our story now moves firmly into the Renaissance period. By this time humanist scholars in the West had rediscovered the works of Plato. To many scholars, Plato’s description of a Universe characterized by its harmony, symmetry, and mathematical proportion deeply conflicted with the complex geometrical models of the Universe elaborated by Ptolemy and later Arabic thinkers. It could be said that the Renaissance thinkers of the day found those models to be aesthetically displeasing, the beginnings of a philosophical strand of thought that simple or beautiful laws must underpin the natural world, which is a philosophy that is still with us today. In the first half of the 15th century, a great hero of mine, the German philosopher, theologian and astronomer Nicholas of Cusa began to challenge those widely accepted geocentric models of the Universe. He came to envision instead a truly infinite universe whose centre was everywhere and circumference nowhere, and moreover teeming with countless stars. He also proposed that neither were the rotational orbits of the stars and planets circular nor were their movements uniform. In my view it is to Nicholas of Cusa, as much as to anyone who we can ascribe the merit, or the crime, of having asserted the infinity of the universe. These were essentially the philosophical thought experiments of a deeply religious man and by no means were they what you might call scientific reasoning. However, they were hugely influential to early scientific thinkers. His ideas were undoubtedly influenced by a combination of religious doctrine, esoteric thought, Arabic observational records and Platonic and Neoplatonic philosophy mixed in the melting pot which was the Renaissance. It is hard to say which influence was the greater but a leap in understanding had certainly been made and it could now be said that philosophers and theologians were having less of a problem contemplating the Infinite than scientists. 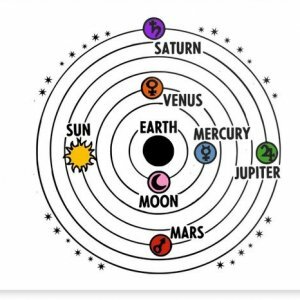 However, science was catching up and by 1515 the Polish astronomer Nicolaus Copernicus had circulated his detailed criticisms of the Ptolemaic geocentric model. In it, he offered an alternative theorem, in which the Sun was now the centre of the universe. The Earth joined the rest of the planets moving in circular motions around the Sun, and the moon in turn revolved around the Earth. The stars were viewed as distant objects albeit still on a fixed sphere and the rest as they say is history. There is no doubt that before publishing his work Copernicus wrestled with a difficult choice. Was ancient wisdom or modern science the path to truth, in hindsight he ended up employing both strands of reasoning to support his work. Interestingly one of the first open supporters of the Copernican system in England was John Dee. Dee had theorized that the 1572 Supernova was a star and not a planetary or atmospheric phenomenon so ideas that the stars were not fixed or the Universe unchanging were not new to him. His most brilliant student Thomas Digges finally advanced the idea of an infinite universe as a scientific concept. He took the Copernican universe and removed the stellar sphere that limited its size. Digges argued, instead, that the stars were at a distance which was to vast to be imagined. Another fundamental breakthrough in thinking about the world had been made. In 1584, another hero of mine Giordano Bruno, the great philosophical and religious thinker took this idea a step further and proposed a complete cosmology without firmament, an infinite universe in which the stars are actually suns with their own planetary systems. To quote from Bruno’s work ‘there are countless suns and countless earths all rotating around their suns in exactly the same way as the planets of our system. We see only the suns because they are the largest bodies and are luminous, but their planets remain invisible to us because they are smaller and non-luminous. The countless worlds in the universe are no worse and no less inhabited than our earth. For it is utterly unreasonable to suppose that those teeming worlds which are as magnificent as our own, perhaps more so, and which enjoy the fructifying rays of a sun just as we do, should be uninhabited and should not bear similar or even more perfect inhabitants than our earth.’ Another radical change occurred in the patterns and framework of European thought, one that was incompatible with the religious doctrine of the time and a view for which Bruno ultimately suffered great pain. Bruno's ‘infinite’ universe was filled with a substance he called “pure aether” or “Spiritus”. This substance offered no resistance to the heavenly bodies which, in Bruno's view, rather than being fixed, moved under their own impetus. Most dramatically, he completely abandoned the idea of a hierarchical universe, instead it is one that is incapable of comprehension and therefore is endless and limitless, and to that extent infinite and indeterminable. Bruno's cosmology distinguishes between "suns" which produce their own light and heat, and have other bodies moving around them; and "earths" which move around suns and receive light and heat from them. Bruno suggested that some, if not all, of the objects classically known as fixed stars are in fact suns. This was again a philosophical breakthrough but without the evidence to support the theory. Hence it was widely disputed. However soon afterwards Galileo began using a telescope to examine the sky and it became harder to argue that the heavens were perfect, as Aristotelian philosophy required. By 1630, the concept of solid orbs had been brushed away. Modern astronomy began to take shape as the Renaissance progressed, despite continued, fierce protestations by the Church. 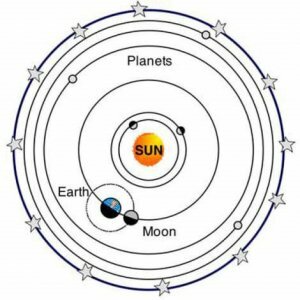 Johannes Kepler, the great lawyer and mathematician concluded that the planets moved in elliptical orbits around the Sun, and so proposed his three laws of planetary motion. He did this at the same time as defending his mother against charges of witchcraft which seemed to be all in a days work during the Renaissance. By 1687, Sir Isaac Newton invented a new telescope which used a curved mirror instead of a lens to look further into space. Newton confirmed that the Earth rotated around the Sun and also established the law of universal gravitation, which ushered in a new age of Science and Enlightenment. Since then mankind has done a pretty thorough job mapping the stars, planets and their moons, and compiling a whole catalogue of astronomical objects and predicting their natures. In 1798 for instance, Laplace proposed the concept of Black Holes, and by 1817 Charles Messier had compiled a list of 103 deep sky objects including the first star clusters, nebulae and galaxies. Astrophysics received a major boost in 1900 when Max Planck invented quantum mechanics and Einstein’s two theories of Special and General Relativity changed the way we viewed the structure of space, which it now transpired was curved in all sorts of myriad ways. Space had become Space-Time with profound consequences. By the mid 1900’s Edwin Hubble had proved that galaxies were separate systems outside of our own Milky Way and that the Universe was expanding. Mankind has now walked on the moon, established Space Stations in orbit around the Earth and discovered thousands of planets outside of our solar system. The age of the Universe has been measured at 13.8 billion years give or take a year, it has been found to be composed of at least 85% dark matter and to be at least 91 billion light years across. However, whether it is truly infinite and unbounded is still a matter of great debate. During this period the hierarchical, ordered and conceptualized cosmos of the middle-ages is replaced by a homogeneous, mechanistically determined infinite universe with atomically constructed bodies governed by mathematically structured laws. However, value concepts like meaning, perfection and harmony as attributed to nature and the Universe are discarded, perhaps to our detriment. The concept of the Infinite moves from defining god to defining space and time. I think it is fair to say that we are still grasping with ideas of the Infinite today.